Here's something new: actually, they're pretty old ideas, I've tried them out to make sure they work (well, mostly). As I come up with something new and/or interesting, I'll add a link below. Give them a try! Auxiliary viewfinders for rangefinder cameras are often more expensive and harder to find than the telephoto lenses themselves.... and you lose your rangefinder and increase parallax error to boot. For some cameras, you can fairly easily make a viewfinder mask that solves ALL of these problems at a very low cost. This sketch shows a mask made for a Contax II or IIa camera, in this case accommodating both 85mm and 135mm lenses in the same mask by adding a 135mm wire frame inside the 85mm mask. 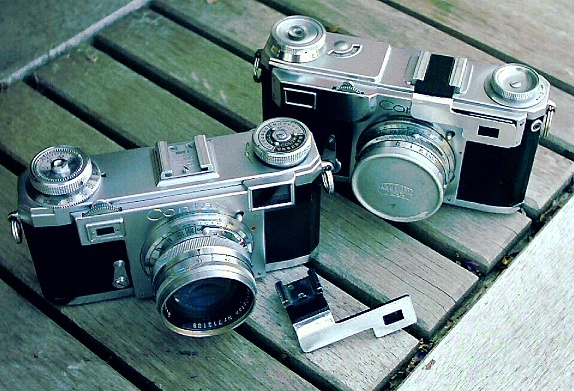 Here's a photo showing the mask for the Contax IIa (detached, foreground) and the Contax II (installed, background). The IIa mask has an accessory shoe added to the top because that camera is synched for flash; on the unsynched Contax II, the shoe is only used for viewfinders anyway, so the extra isn't needed. Make a Lens from Plumbing Supplies! Run your OM2S, OM3 or OM4 on AA Batteries! Use Kalimar 660 Lenses on your Pentacon Six or Kiev 60! Use 35mm SLR Lenses on Medium Format Cameras!